Notes: Reports of these vehicles are sketchy so most of these rules are for how these vehicles were intended to perform during Operation Greif and not how they actually performed. Anyway, these things are just to cool not to make them usable in a battle so they get a bit more credit at duping the average GI then probably should be allowed. You are also going to need the core BGWWII rule set to benefit from the rules below so get 'em. Vehicle Chart: We just use the M10's chart for locations but use the Panther Ausf. G's characteristics and effects. The M10 and Panther' chart can be found in the Tanker's Challenge supplement. Nahverteidigungswaffe: Late production panzers are fitted with a launcher in its turret that is capable of firing small shells from within the safety of the turret. The launcher has a 360-degree field of fire and is capable of firing fragmentation, smoke or flare shells. It will cost the loader one action to load and another to fire the Nahverteidigungswaffe. The launcher may be rotated 180-degrees and be fired in the same action it moved. Both the fragmentation and smoke shells produce a Medium HE template when fired. The shell's template can be placed anywhere along a 360-degree arc, 2" away from the center of the vehicle. The crew must be Buttoned-Up when the Nahverteidigungswaffe fires a fragmentation shell or any exposed crew could be hit. Note that if any turret crew are exposed, the weapon will not be used until they duck down into the turret or they Buttoned-Up. Winterketten or Ostketten Tracks: This vehicle may be fitted with the Winterketten track grousers for use in ice and snowy fronts or from early '44 on with the Ostketten track for muddy battlefields. The Winterketten will provide a -1 to all Bog Checks made in snow or icy terrain and the Ostketten will provide a -1 to all Bog Checks in muddy terrain. Both tracks types will also negate any High Ground Pressure penalties. Availability for each is a 8 or less for any front. Panzer Phone: It was found that infantry had a hard time communicating with panzer crews without exposing themselves or the crew to enemy fire so taking an idea from the Americans, most panzers were fitted with a simple field phone fitted in a box mounted at the rear right side of the hull. This phone allowed infantry to communicate with the buttoned-up crew without exposing them to enemy fire. This upgrade allows Buttoned-Up crews to be aware of any enemy units that the accompanying infantry are aware of just as long as a single figure is manning the tank's phone. Availability is a 12. Clever Ruse or Stupid Kraut: Whenever an Allied unit makes a Sighting Check against these Ersatz M10s, they will suffer a +2 to their Sighting Chack. Possible Fratricide: It would be assumed that any German units on the field would be aware of these fakes but if there are any true M10s present, all German troops will first have to pass a successful Skill Check in order to fire at it. This represents the possible hesitation knowing that there are friendly panzers dressed up like M10s present on the battlefield. Top Armor: Because of the steep slope of the front glacis plate, any hits to locations 6 or 11 on the HT will use the HF AV. No AAMG: Because of the lack of a commander's cupola, this Panther conversion will not be able to field a AAMG as normal. No Schurzen: To help facilitate the ruse, the Panther's Schurzen has been deleted. 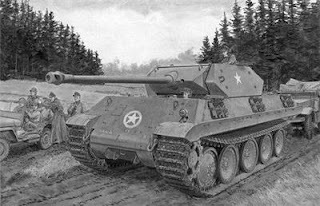 No Zimmerit: No Panther M10s will have zimmerit applied to its armor. Wargaming Piece: Quarter Kit does a 1/48 and 1/50 scale conversion for this OD Panther.